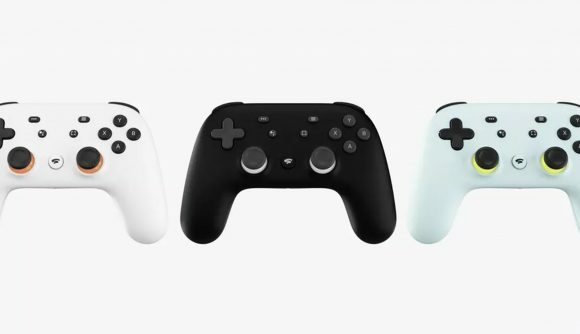 Google has just unveiled its much-anticipated Stadia gaming service, and, further to a patent application that surfaced earlier this month, it will have its own controller. Named simply the Stadia controller, it follows much of the current conventions in controller design: there’s a D-pad, four face buttons, and two thumbsticks that happily are placed parallel to one another rather than one being offset as in the Xbox controller – which I’ve always felt is madness. Fortunately it doesn’t look anything like the clumsy mockups that circulated with the patent application, but then there was never any reason to believe that it would. Where the Stadia controller differs is the addition of a Google Assistant button, through which you can vocally call on Google’s Alexa equivalent and even ask it for help with the game. There’s also a ‘capture’ button that’ll let you save and share gaming moments, similarly to the DualShock 4’s ‘Share’ ability. Obviously these functions require internet access, and thus the wireless Stadia controller connects over WiFi, rather than Bluetooth. You can see the controller in action in the following introduction trailer, which also includes a man in a bath of cheese puffs, an angry pirate grandma, and a lot of shouting. All the most important ingredients for a video, then. Let us know what you think below.